Amazing Location! Walking to distance DC’s free museums plus more! Two bedroom, one bath condo near 3 metro stations and 4 metro lines (orange, blue, yellow and green metro lines). Walking distance to Wharf at Waterfront the hot spot in DC just 3 Blocks away from the unit. DC’s free museums and art galleries. 5 blocks to the Smithsonian’s National Air and Space Musuem, National Museum of the American Indian Botanical Gardens and Arena Stage Theatre. Walking distance to Capitol Hill, Library of Congress, the National Mall and home of the Cherry Blossoms at the Tidal Basin. Within Walking distance or a metro ride away from: The National Convention Center, the Nationals Baseball Stadium, Museum of Natural History, Gallery of Art, Newseum, International Spy Museum, White House, Lincoln and Jefferson Memorial, World War II Memorial, Holocaust Museum, East Potomac Park Golf and Miniature Golf, and more! 2 bedrooms both with queen size beds, we also provide extra Queen size air mattress with bedding; ample closet space in both rooms, 1 room with additional customized closet and balcony with park view. Open living/dining combo with sliding glass doors leading to balcony overlooking a park. Kitchen fully equipped, gas cooking and a breakfast bar. Excellent viewing for fireworks from both balconies. 1 block to grocery store, pharmacy and coffee shop. Excellent location. Close to everything you want to see in DC! Excellent location. Tree lined neighborhood close to everything! Walking Distance to Chinatown/Gallery Place. Can rent Capital Bikeshare (across street from the apartment). Ideal for riding along at the National Mall! Great location, attentive host, very clean with everything we needed. Easy walking distance to the mall, grocery store, and waterfront. Loved this place for it’s proximity to everything. We sat on the steps of the Capital building & walked back to the apartment in 15 minutes. It is one block from the Museum of the Bible. Last night we left the Washington Nationals game during top of the 7th & were sitting in the apartment to finish watching the game bottom of the 8th (bus P6 picks up directly in front of Potomac Place). Safe neighborhood- no issues with car parked around the block entire stay. Relatively quiet location- did hear nearby fire station & dog barking/sliding doors opening in unit above us. John texted check in/out reminders & made sure all was well during our stay. Unit was clean & appointed with what we needed for a 3 night stay. The apartment was clean and convenient to all of the sights. The Wharf was super nice and an easy walk. The owners were helpful and available. I would highly recommend. Thanks! Convenient, clean, nice. Roomy. Hosts very helpful. We loved our stay. The condo is just as it appears in the photos. So much better than staying at a hotel. John kept in constant contact with us which was nice. The kitchen was well stocked as were the bedrooms and bathroom. The condo was in a perfect location, maybe 5 minute walk from the metro and Safeway grocery store and the bus stopped right outside the building. We walked to the Mall in about 10 minutes, which was great. There is a lot of walking to be done in DC so this wasn’t far at all. The neighborhood felt very safe and we walked to the waterfront with no problems. There are signs saying no short term rentals but no one questioned us, we just came and went. Would definitely go back again. My family and I had a wonderful experience and stay with Tidal Basin! Great communication with the owners made the trip so much easier and enjoyable. 4-5 blocks from the National Mall, Felt like a very safe neighborhood for walking back and forth. Grocery store within walking distance too (2 blocks). One thing to be aware of is the firehouse/EMS station is about a block away, so there are frequent sirens depending call volume. We did not seem to mind, but if you are a light sleeper or have babies, it may affect your stay. Thanks again John! Hope to stay with you guys again!! The National Mall is just footsteps away from the Waterfront, and has one of the world's greatest collections of museums. Four blocks to Smithsonian Air and Space Museum, Native American Museum. Walking distance to Capitol building and Library of congress. 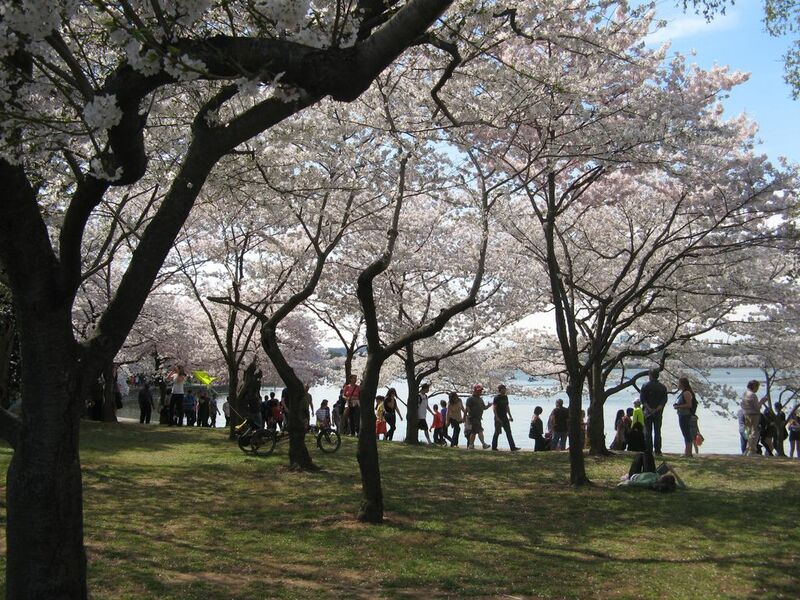 Condo is walking distance to all Cherry Blossom Festivals and activities.